The labor ledger showed that the "fort at Crimea" was constructed in August 1857 and cost $36.37. Thus, there is no connection between the fort and the Civil War. In fact, the 1894 newspaper account of the estate claims that the fort was inspired by the Russian redoubt at Balaklava and commemorated the "Valley of Death" described in "The Charge of the Light Brigade" with Thomas Winans picturing himself on the side opposite the heroic Britons. The 1876 Hopkins city atlas showed a "Fort, 6 Guns" southeast of the villa. By 1935, Winans grandson Reginald Winans Hutton thought that the fort was related to the Civil War. The people seated on the cannons are not related to the Winans or the Huttons family. 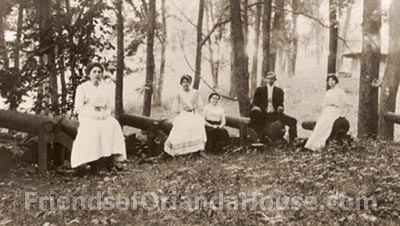 They were from the Gordon, Anderson, and Hodnott families which lived on a farm just east of the Orianda.